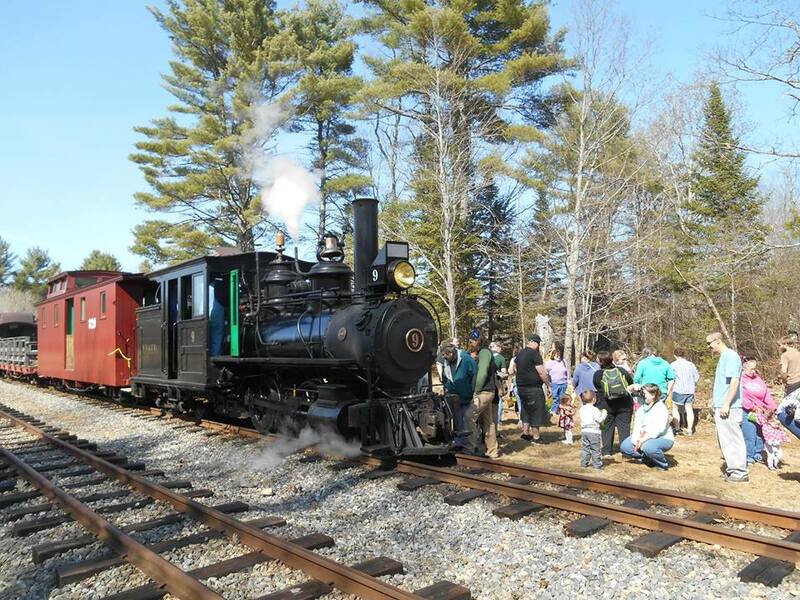 Let’s celebrate Easter on the Sheepscot Valley Narrow Gauge this Saturday, April 20th! Ride one of our Easter Eggspress trains from Sheepscot station (97 Cross Road, Alna, Maine) to Alna Center station where an Easter egg hunt awaits! Trains will depart Sheepscot from 10.50 a.m. to 3.30 p.m.
Our Alna Center Easter egg hunt will be broken into three age groups (0-3 years, 4-6, 7 and up). Bags for collecting eggs will be provided by our museum, so you don’t need to bring your own. Advanced ticket purchases at wwfrytickets.simpletix.com are discounted and strongly recommended to guarantee seating on a particular train. • Free for children ages 3 and under. We hope you can join us on the Easter Eggspress! 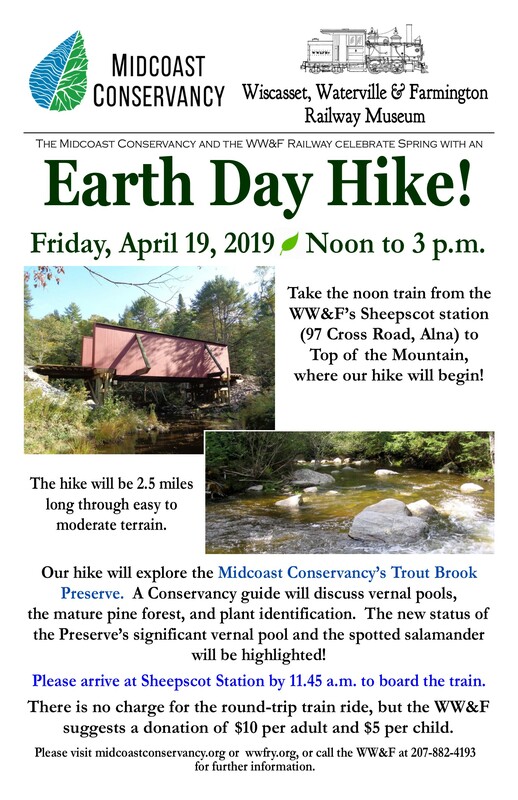 Join the Midcoast Conservancy aboard the Wiscasset, Waterville & Farmington Railway April 19th for a day of service and fun. Conservancy volunteers will clean up the trailhead, take a train ride, and hike at Trout Brook Preserve in Alna, Maine. 9:30 – 11 a.m.: Trout Brook Trailhead cleanup: For those who want to give back a little extra in the spirit of Earth Day, we will be picking up trash and freshening up the trail and surrounding trailhead before the hike! 11:30 a.m.: Gather at the WW&F Railway’s Sheepscot station at 97 Cross Rd in Alna. 12 noon: The train departs Sheepscot Station. Please bring a bag lunch if you plan on attending both the service and fun sections of the day. The second half of the event will run from 12 noon to 3 p.m. The train will leave the WW&F’s Sheepscot station at noon, so please arrive early – come check out the museum and train yard. The WW&F Railway’s steam train will venture through the woods to Top of Mountain station. After debarking the train, we will hike just over 2.5 miles on terrain that is of easy to moderate difficulty. Come along for the beautiful views of Trout Brook! Running Late? Not a problem: you can meet us there. Hikers will arrive at Trout Brook Preserve Trailhead around 12:45. Join us for a fun day in the woods and celebrate the wonderful earth we live on! If you have any questions email landmcc@midcoastconservancy.org or call 207-389-5163. Many of the 100+ volunteers who traveled to our Museum’s 2018 Columbus Day Work Weekend to work on our Mountain Extension as well as other projects. During our Spring Work Weekend Friday to Sunday, April 26th to 28th, we will be ballasting, lifting, lining and tamping the 1420+ feet of new track built last fall, plus working on other projects! Susan Hackett photo. Spring has arrived in the Sheepscot Valley! During the first two Saturdays of April (6th and 13th), our volunteers will be finishing preparations for a busy 2019 season. You can follow our progress in our forum’s April 2019 Work Reports thread. On Friday, April 19th, we will be partnering with the Midcoast Conservancy to celebrate Earth Day. In the morning, the Conservancy will lead a clean up of the Trout Brook Trailhead. At 11.30 a.m., friends and volunteers will gather at our Museum in Sheepscot for a 12 noon steam train ride to Top of Mountain. After debarking the train, our riders will hike just over 2.5 miles on terrain that is of easy to moderate difficulty. Come along for the beautiful views of Trout Brook! Our annual Easter Eggspress will run the next day, Saturday, April 20th. 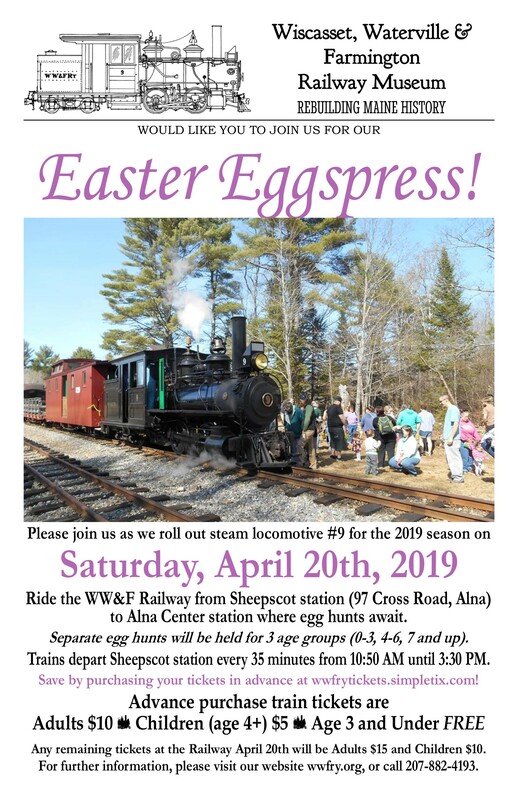 Steam trains will depart Sheepscot station (97 Cross Road) from 10.50 a.m. to 3.30 p.m. for Easter egg hunts at Alna Center. Tickets and further information can be found at wwfrytickets.simpletix.com. We end the month with our annual Spring Work Weekend Friday through Sunday, April 26th through 28th. Our main project this spring will be the ballasting, lifting, lining and tamping the 1420+ feet of track built last fall on our Mountain Extension. We’ll also be working on a number of other smaller projects so our Museum will be ready for the 2019 season! Join Us on the Easter Eggspress Saturday, April 20th! 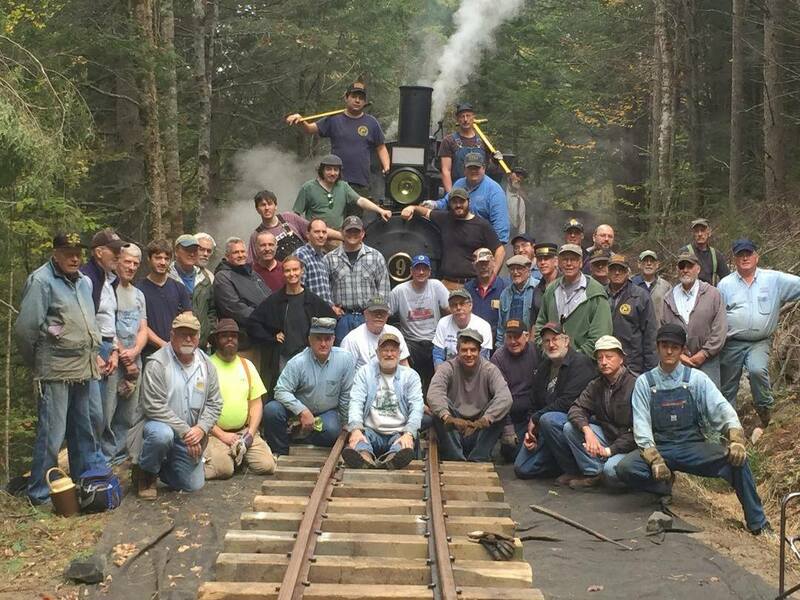 Let’s celebrate Easter on the Sheepscot Valley Narrow Gauge! Ride one of our Easter Eggspress trains from Sheepscot station (97 Cross Road, Alna, Maine) to Alna Center station where an Easter egg hunt awaits! See Us at the Whitefield Lions Club Show at the Augusta Armory this Saturday! Our Museum will have sales tables at the Whitefield Lions Club Model Railroad & Dollhouse Show at the Augusta Armory, 179 Western Avenue, in Augusta this Saturday, February 16th, 10 a.m. to 3,30 p.m. If you’re in the Augusta area, please stop by and say Hi! to our crew! Steam & Sleighs February 16th & 17th! Photo courtesy of Matthew Malkiewicz. Copyright Matthew Malkiewicz/Lost Tracks of Time. Experience an unforgettable day at the Wiscasset, Waterville & Farmington Railway during our second and final “Steam and Sleighs” event for this winter! 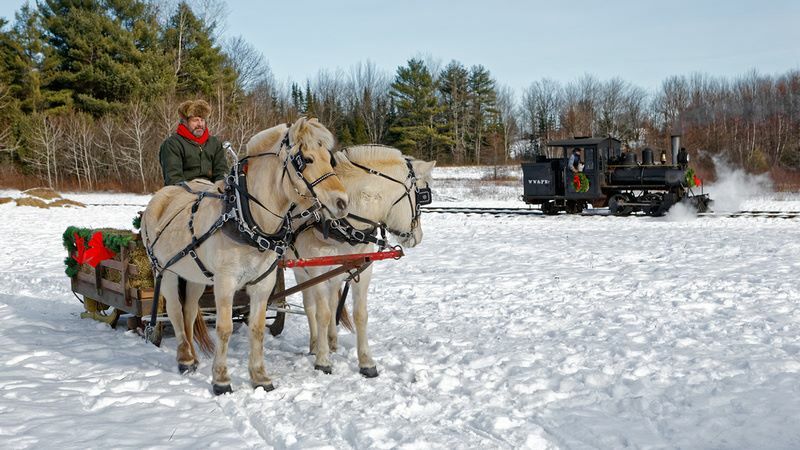 Ride the Railway’s steam-powered Sheepscot Valley Winter Service trains and enjoy a horse-drawn sleigh (or wagon) ride, backcountry cross country skiing, snowshoeing, winter hiking, and more at our station stops along your journey. Trains will leave from Sheepscot Station (97 Cross Road in Alna) and make stops at Alna Center and Top of Mountain Stations. At Alna Center, detrain for horse-drawn sleigh rides and cross country skiing along with hot beverages prepared on the station’s potbelly stove. Outside, warm your hands around the bonfire and participate in a variety of demonstrations. In addition to the heated station, a portable toilet will be stationed here. At Top of Mountain detrain for snowshoeing, backcountry X/C, hiking and to explore the work the railway is undertaking on our Mountain Extension, a .75 mile extension of the railway to a new station adjacent to Midcoast Conservancy’s Trout Brook Preserve. For your convenience, a heated caboose and attendant will be on hand to help direct you. There are no additional facilities at this remote location. Trains leave Sheepscot Station (97 Cross Road in Alna) at 10:30 a.m., 12 noon, and 1:30 p.m. An additional 3:00 p.m. train from Sheepscot will pick up hikers, skiers and snowshoers. Visitors are welcome for a train ride only at 3:00 p.m. Tickets are valid for round trip passage to and from Sheepscot Station all day and include access to all of the day’s activities. You may return on any train you wish to or break your journey at any station and resume it on a later train. Steam and Sleighs will be held Snow or Shine. In the event of inclement and hazardous weather, the event will be canceled and tickets will be refunded. Come dressed prepared for the weather. If you care to engage in outdoor activities, please bring your own skis, snowshoes, or outdoor gear. Please arrive 15 minutes in advance of your train’s departure time to ensure a relaxed and pleasant experience. Advance tickets can be purchased on line here. To reserve your spot and avoid unnecessary waiting advance tickets are encouraged, but not required. Tickets will also be available the day of the event at Sheepscot. 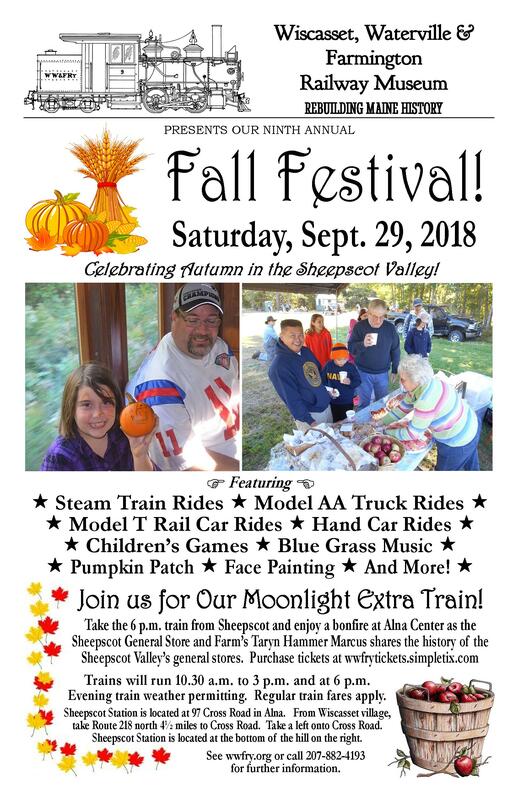 We hope to see you on the Sheepscot Valley Narrow Gauge! Steam & Sleighs January 19th & 20th! Advance tickets are required, which can be purchased on line here. 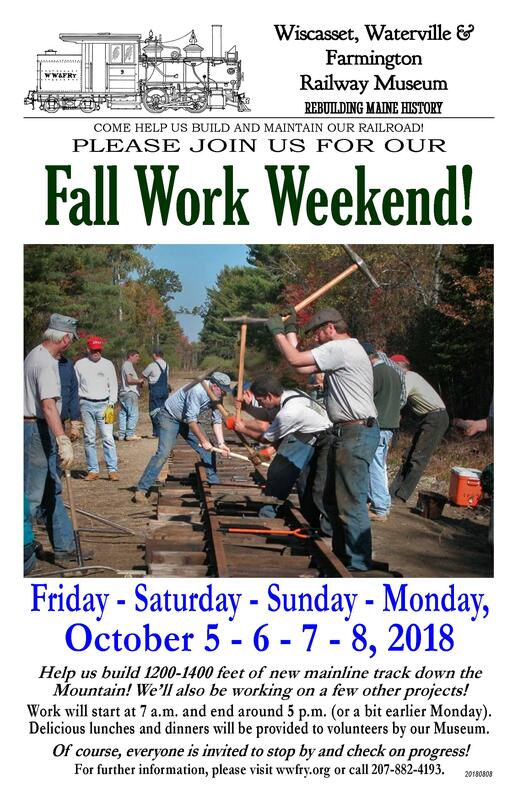 Our Fall Work Weekend October 5th through 8th! • Construction of 1200 to 1400 feet of main line track down the Mountain! • Clearing land in Sheepscot for our parking lot expansion. • Burying conduit from the Sheepscot shop building to the Percival House. • and other projects are likely as well! Of course, visitors are welcome to just watch & see how our Sheepscot valley railroad is maintained and grows! Work will start at 7 a.m. and end around 5 p.m. each day (or a bit earlier Monday). Delicious lunches (all four days) and dinners (Friday – Sunday) will be provided by our Museum. Steam-powered passenger trains will be operating Saturday and Sunday. This will be one of the last opportunities to see our steam trains this year. Steam will be operating for our Victorian Christmas celebration December 15th. If you can’t join us in person, you can follow weekend progress in our Mountain Extension and Fall Work Weekend 2018 forum threads. The weather forecast so far looks great for Columbus Day weekend. We hope you can come help build and maintain our Museum! Fall Festival and a Moonlight Extra Train September 29th! Enjoy a day of games, fun, and happenings at our annual Fall Festival! Board our train at Sheepscot Station at 97 Cross Rd, Alna, and travel up the line to Alna Center station, location of the festival. There will be face painting, a pumpkin patch, hay rides in the back of a Model AA truck, games and fun for the whole family! Once again we welcome the Bluegrass Music Association of Maine to the festival, for a bluegrass pickin’ party! Enjoy some old fashioned music! Trains depart from Sheepscot regularly at 10:30 AM, 10:55, 12 noon, 12:25 PM, 1:30, 1:55, and 3:00 (the last regular train); however depending on how busy it gets we may run trains more frequently than that. Purchase your ticket at Sheepscot station (97 Cross Road) ($8 for adults, $7 for seniors 60+, $5 for kids 4-12, kids 3 and under free) and board the train. Spend as much time as you like at the festival. Bluegrass pickers (with instruments) ride free. Please join us for our Moonlight Extra Train! 9/21/18: Sorry — our evening train is now sold out! We hope to offer a similar train in October. Please watch wwfry.org for updates. There will be a 6 PM evening train to Alna Center, where visitors will be entertained by a bonfire, locally-produced foods and a talk by Taryn Hammer Marcus, of the Sheepscot General Store and Farm on the significance and history of General Stores in the Sheepscot Valley. The train will return to Sheepscot by 8:00. Please bring your camp chairs! Ticketing for this evening train is separate from the day’s events. 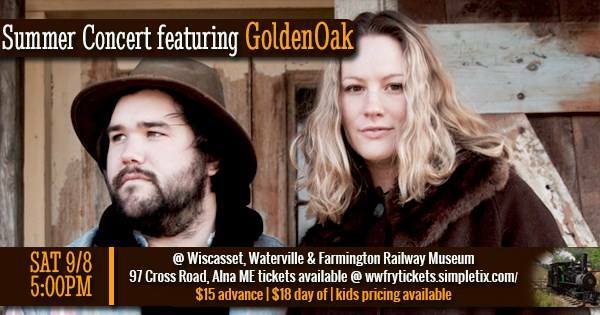 Advance tickets for the evening train only are available at wwfrytickets.simpletix.com. Sorry — our September 29th Moonlight Extra Train is now sold out! We hope to see you September 29th! Our Final 2018 Summer Concert September 8th Features GoldenOak! Our final 2018 Summer Concert the evening of Saturday, September 8th will feature GoldenOak. GoldenOak is an Indie Soul-Folk band fronted by sibling duo Zak and Lena Kendall. Originally from the Sandy River Valley of Western Maine and now based in Portland, they began to write music and perform in 2014. GoldenOak released their first album, Pleasant St., in 2016 — an album they co-wrote with cellist Seth Wegner. The full length album painted a landscape of the duo’s childhood and their experiences growing up and leaving home. The original album with beautiful instrumentation and voice solidified the band as ambassadors of the Maine Folk Scene and earned them praise such as a nomination as “one of Portland’s most important upcoming bands” by Dispatch Magazine. Over the last two years, they shared the stage with many notable artists such as Lady Lamb, The Dustbowl Revival, The Ghost of Paul Revere, and The Mallett Brothers Band. In October 2017, GoldenOak released Foxgloves, a 6 track EP that builds on Zak and Lena’s folk roots with a remarkable orchestral approach and earthy sound. The band kicked off their Foxgloves release tour with a sold out show at Portland’s One Longfellow Square, and in December, Foxgloves was voted “EP of the Year” by the Portland Music Awards. Zak and Lena record and often tour with fellow musicians and band mates, Seth Wegner (cello), Max Eddington (piano), and Jackson Cromwell (percussion). Find out more at GoldenOakband.com. Our concert will be held under a big tent at Alna Center station, rain or shine. The concert train will leave Sheepscot station promptly at 5 P.M. and return at 7:30 P.M. Parking, round-trip train fare, and concert admission are included in the price of the ticket: $15 for adults/$8.00 for children ages 4-12. Children 3 and younger are free. Sales are limited to 100 tickets; advance sale tickets are available at wwfrytickets.simpletix.com. We hope you can join us Saturday evening, September 8th!